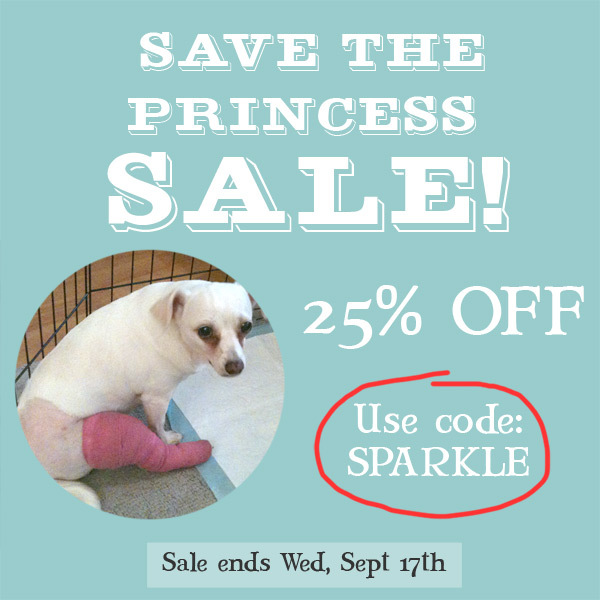 While Princess Sparkle is recovering nicely from her surgery (check out my posts here & update here to read more about her luxating patella), it turns out that the surgery is actually harder on me than it is on her! I have to administer a syringe full of painkiller medication each morning, along with trying to trick her into swallowing her antibiotics with each meal. Stuffing the pill inside a piece of cheese worked great for the first couple of days, but she’s on to me now. I carry her downstairs to pee. Then I walk the pug separately (he’s going blind so can’t handle stairs on his own). I’ve started bringing her up on the couch with me to hang out, but need to make sure she doesn’t jump down & injure her leg, so the couch has got the metal pen wrapped all around it, plus blocked off by the coffee table & other barriers. Every 7 days it’s back to the vet for another cartrophen injection. It’s a full time job taking care of this little one! I’ve ended up cancelling a few of my market dates – a week at Granville Island plus my last 2 Sundays at Kitsilano farmers market – so I can stay home & take care of her. The time off combined with the vet bills haven’t been great to my bank account this month, so I’m having my first ever sale! Everything in my Etsy shop is 25% off! Even better – prints are BUY ONE, GET ONE FREE! Purchase any print & enter the name of the 2nd print you’d like for free on checkout. No code needed! The sale is on for 1 week only! Click here to visit the shop now! Next postOne More Day to Save!